StopTech Sport Rotors are 1-piece slotted, drilled or drilled/slotted direct replacements discs for your factory brake system and stock calipers. They offer improved cooling as well as other advantages the competition doesn't offer. in all StopTech Sport Kits, StopTech Street Performance or Centric Fleet Performance Brake Pads. 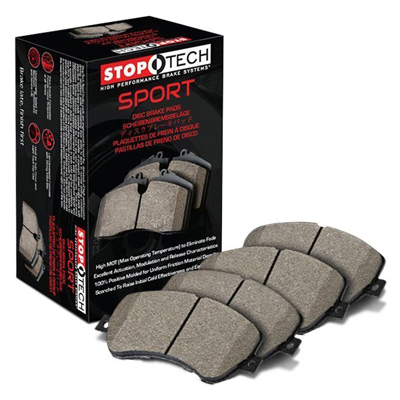 Stoptech brake pads combine the benefits of premium street brake pads with aggressive friction formulas suitable for light track day and autocross use. • Para-aramid composites provide linear response regardless of pad temperature. Braided stainless steel brake lines reduce the system's compliance and improve brake pedal feel and modulation. 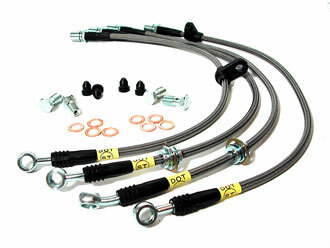 StopTech's Stainless Steel brake Lines are D.O.T. compliant and designed to fit your vehicle.